In June 2014, we visited Walt Disney World for Star Wars Weekends. We used the Disability Access Service Card at Walt Disney World and I wrote about our experience. As the Disability Access Service policy has slightly changed since our last visit, I thought I’d write an update. We’ve been fortunate to visit Walt Disney World four times over the last five years and we’ve seen the disability access policy evolve. Our first visit (in 2011) we used the Guest Assistance Card. 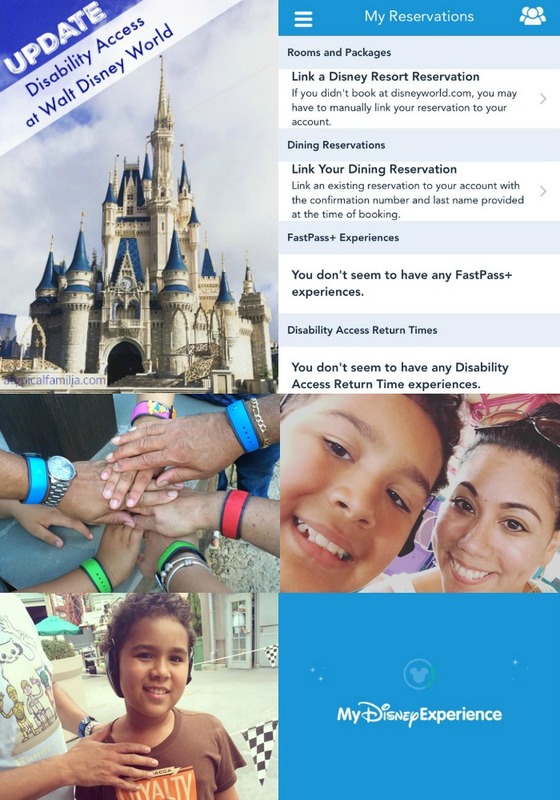 When Disney heard about some wealthy Manhattan moms abused the policy, the policy was changed and called the Disability Access Service Card (DAS) – that’s what we used during our 2014 visit. Our third visit (Oct 2014) we went for Mickey’s Not So Scary Halloween Party and we didn’t need to use it at all. 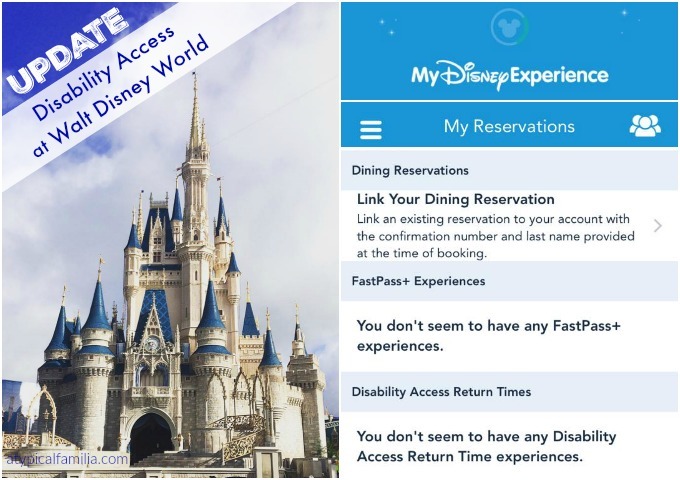 And now Disability Access Service is linked to your Magic Band and the My Disney Experience app. Which is so much more convenient! You don’t have to worry about carrying around the DAS card with you from park to park. I don’t believe suing Disney is the right thing to do. And I don’t believe the policy change is discriminatory. I think Disney is trying to ensure that the people who really need Disability Access are the ones using it. Either way – the Disability Access works for our family and using it has not been an issue for us. Upon arriving at any Walt Disney World Park visit Guest Relations. IMPORTANT: Everyone in your party must be present when you request Disability Access at Guest Relations. Then the cast member will scan everyone else’s Magic Band. Disability Access will work at all of the Walt Disney World Parks for the duration of your stay. You Have Disability Access – Now what? So this is how Disability Access works. Approach a ride and ask the cast member for a Disability Access Return Time. The cast member will scan your Magic Band and tell you what time you may return. Don’t worry if you forget the time. Similar to the FastPass+ – your return time will be automatically linked to the My Disney Experience App. Note: When requesting a return time, the person requiring the Disability Access does not need to be present. You may return to the ride at (or after) your designated time. 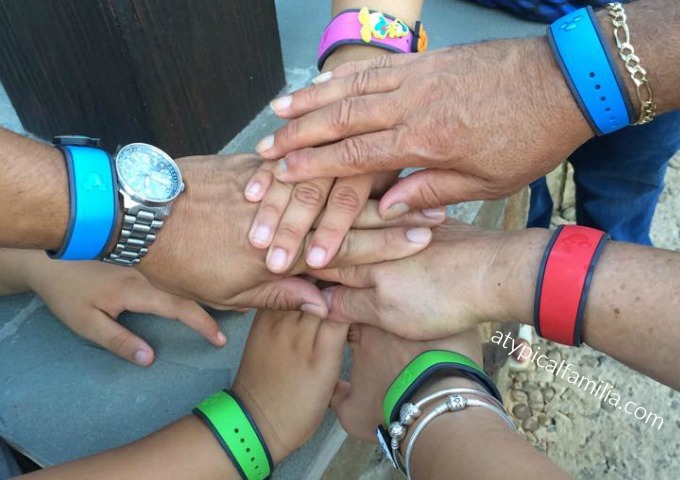 When you return, the person with the Disability Access must be the first one to have the Magic Band scanned. And then the rest of your party can scan their Magic Bands. Note: You may only request 1 Disability Access Return Time at a time. After your experience, you may request another. My best experience has been planning our day around FastPass+ selections. Before you even arrive at Walt Disney World, you can start planning your day and the experiences you want to have with the FastPass+. If your purchase your ticket in advance (or have an Annual Pass), you may start making selections as early as 30 days before you arrive. If you have a Walt Disney World Resort vacation package, you may start making selections up to 60 days before check-in. There is no extra charge for this – USE IT! 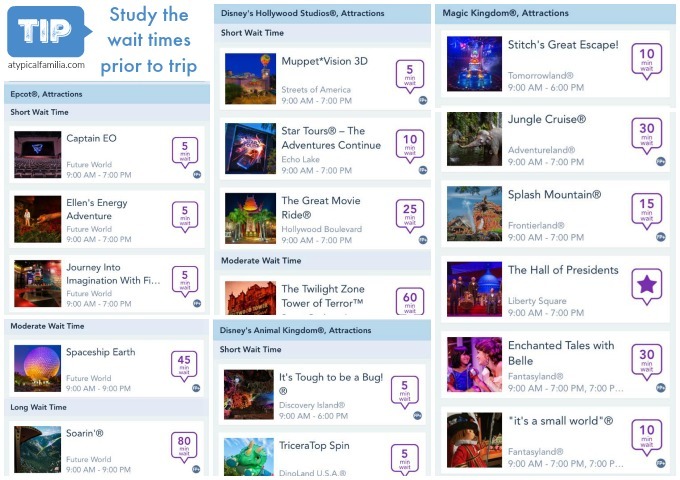 Now here’s the thing with the FastPass+ you may only request 3 selections per day in advance via the My Disney Experiene or online (don’t worry – you can modify selections at any time). You may also request 3 FastPass+ selections same day at a FastPass+ kiosk. However, I do not recommend waiting until the day you arrive at a park. Once you redeem the initial 3 FastPass+ selections, you may make an additional selection at a FastPass+ kiosk. The My Disney Experience app was so helpful during my weeks of planning. All my information was right at my fingertips. I especially love the ‘wait time’ feature. It was super helpful when planning my FastPass+ selections and planning my days. Disney isn’t the kind of place where you can just show up with your kid – you need to plan your day out. Prior to our trip, I checked the wait times for rides. I also checked at different times of day to get a sense of peak times. And then throughout our day at the Parks, I’d check the wait times to determine what to do next or to figure out which ride to request a Disability Access Return time for. Walt Disney World is HUGE! According to knowdw.com, this is a breakdown of each Walt Disney World Park. That’s a lot of ground to cover and the last thing you want to do is walk in circles. As soon as you make your FastPass+ selections, check out nearby attractions (you can study maps of each park on the app). This is where studying the wait times will be useful. Research each ride (especially if it’s your first time going). You know your child best and you’ll have an idea of what they will like. Doesn’t make any sense to wait for a ride or request a Return Time for something they have no interest in. I know, I know. Easier said than done but the earlier you arrive at the park, the less likely you are to stand on a long line. Get the favorites out of the way and then use the Disability Access Service to repeat rides or attractions with long wait times. #FamilyTravels Tip: A great time to go on rides is right before, during and immediately after Parade Times and/or Firework shows. While using the DAS we found that most kids and families are gathering to watch the festivities – and the wait time for other attractions eases up. Lots of NEW attractions coming to Walt Disney World Parks this Summer. Check it out – click → HERE. For more information regarding Disability Access Service & FastPass+ visit disneyworld.disney.go.com. Thanks so much for this great write up! After reading your post I felt much better about our upcoming park visit. or was it different? you can send me an email if you want to respond privately. Thanks for your time!